Jordan- Jordan is country in Middle East. Jordan is bordered by Saudi Arabia, Iraq, Syria is Israel and Palestine. Along the western border Dead Sea and south west lies red sea. Most popular city in Jordan is Amman which is also the capital of the country. Most of the people follow Sunni Islam and few of them also follow Christianity. Jordanian culture is fairly homogeneous but you will probably notice a fairly distinct social difference between the Bedouin areas particularly in the south and urban west Ammanites. It is said that Jordan has been inhabited since dark ages and is name after Jordan River. Wadi rum is well known for rock climbing and trekking apart from prehistoric rock paintings graffiti and temples. Amman is the capital of Jordan it is modern city with numerous ancient ruins. Amman is one of the most liberal and westernized city of Jordan. Dead sea is salt lake easily accessible from Jordan It is 430 feet below sea level and is the most saline lake of the world people believe that the sands on the shores of Dead Sea can cure skin diseases. Petra is historical and archaeological city in south Jordan. 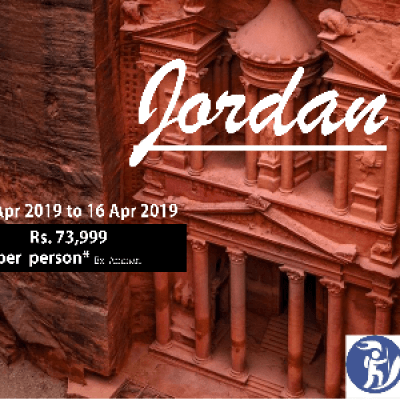 The city is famous for its rock cut architecture and water conduit system another name for Petra is the rose city due to the color of the stone. Out which it is craved it has been a UNESCO world heritage site since 1985. 2) 6 Nights Hotel Accommodation at suggested category of Hotel. 6) Entry Fees for all the sites mentioned above. 4) Any item of personal nature like tips, laundry, telephone calls etc. 8) Medical Expenses other than first aid.